The "Kangaroo Route" from Australia to Britain became a shorter hop Saturday (March 24) when the first direct passenger service left Perth for London, with the 17-hour flight set to break aviation records. 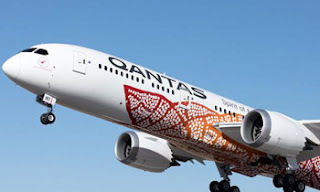 Qantas' 14,498km journey from the south-western city to London is the world's third-longest passenger flight, the Australian carrier said, and the first ever regular service to connect the two continents directly. Captained by Lisa Norman, it will also be the longest Boeing Dreamliner flight in the world. The new link is part of Qantas' ambitious plans, unveiled over the past two years, to add ultra long-haul flights to its global schedules. This will eventually include non-stop flights from Australia's eastern seaboard to Europe in an effort dubbed "Project Sunrise". Qantas chief executive Alan Joyce last year said such flights were "the last frontier of global aviation ... the antidote to the tyranny of distance and a revolution for air travel in Australia". The world's second-oldest airline operated its first "Kangaroo Route" service, from Sydney to London, in 1947, when it took four days and nine stops. Joyce called the new Perth-London service a "game-changing route". Tourism officials hope the shortened travelling time will open up Australia's less-populated west coast to more domestic and international visitors. A key concern for the Australian airliner has been beefing up comfort levels for the ultra-long journey, with passengers set to enjoy improved air quality, lower cabin noise and reduced turbulence. Some passengers will also wear special monitors and devices so researchers from the University of Sydney can collect data on their sleeping and activity patterns, mental state, eating patterns and hydration before, during and after their long flight, Sydney's Daily Telegraph reported. It is not the first time Qantas has undertaken a direct flight from Australia to Europe. The carrier in 2015 flew a one-off charter service from Perth to Istanbul to take Australians to Turkey's Gallipoli to mark a centenary since troops from the Australian and New Zealand Army Corps (ANZAC) fought there in World War I.
Qantas also flew one non-stop passenger flight from London to Sydney in 1989 with a Boeing 747.